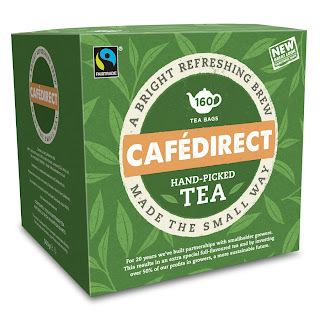 Cafe Direct is a 100% Fairtrade company that have been campaigning to get people like you to pledge to 'drink better tea'. The 'better tea' is of course their own brand of tea, and no this isn't one of my five quid per tea temple type artisan teas - this looks just like a British cuppa we know and love. Cafédirect teabags contain the tender top two leaves and bud from the tea bush, made possible by paying actual human beings (imagine that) to pick the tea leaves by hand. They claim this gives a better taste to their teabags compared to some estates that use machines to pick the tea. This is because the machines grab leaves and twigs quite low down, leading to twiggy tea. Another reason this campaign interests me is because I want to know where my brew comes from and I don't believe in sitting on my throne drinking tea while other unseen people suffer. Don't get me wrong, thrones suit me just fine, but why can't the economy benefit everyone? To me, a fair trade, should be the norm and not a label. 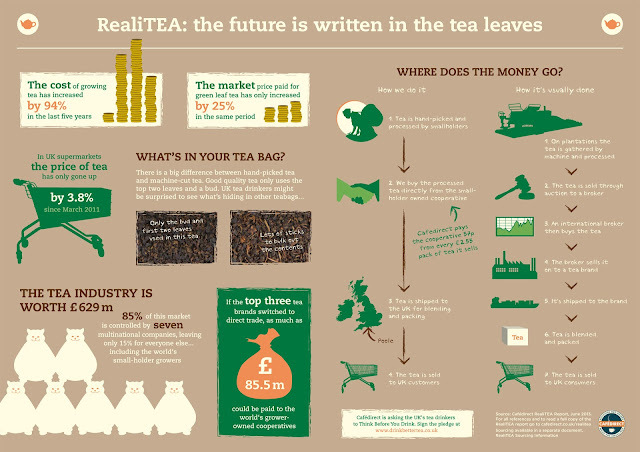 The #RealiTEA campaign asks you to pledge to swap your usual tea (provided by bigger brands) for Cafédirect teabags. They may be a few pence more expensive but you'll apparently get a better taste and feel better for knowing the money has gone back into the tea industry. But does it walk the walk or just talk the talk? Here are two tea bags. The one on the left is the Cafédirect (CD) teabag and the other is a mass produced mystery teabag made by one of the top five most familiar brands (T5). The teabags look very similar here, apart from the shape. Only a slight difference in the scent. CD leaves are slightly bigger and more intact whereas the mystery T5 brand almost look wet as the smaller dust pieces can be smudged. The T5 brand is also lighter and browner with more brown pieces in it, possibly the twigs. CD texture is harder and crunchier whereas the T5 is soft like sand. CD is unbearable without milk as it's a strong brew. T5 is softer so can handle without milk, although both obviously designed for milk so doesn't matter. With milk added, the CD appearance has darker red tones and T5 a yellow lighter appearance. CD a bit bland. T5 feels dustier/softer but more sweet for some reason and more the normal brew used to and even comforting. With milk plus sugar; the sugar adds a nice sweet note to the decent base provided by CD, which makes it the best now. The T5 with sugar doesn't add to the taste for me and falls a bit flat. The Cafédirect tea has a harder edge to its taste and the mystery top five known brand has a softer, rounder taste. So one is straight down to business and the other a little wimpy but friendlier (sounds like a relationship!). If I took both teas with just milk, i'd go for the top five brand for taste as it's a bit more gentle. However, with a pinch of sugar i'd choose the Cafédirect teabag, which really comes into its own with a sweet note on it. This might not be a simple answer, but I think you can see and taste that the Cafédirect tea is of higher quality. Whether your taste buds agree is a different thing altogether. Then again, I like the taste of Mcdonalds fries! And if this experiment is anything to go by, I don't mind twig tea either! I'd suggest that if Cafédirect's fairtrade report is as good as it sounds, then it would be worth trying a box for yourself and making your own mind up because if you like it, you're potentially doing a lot more to help growers and as well as re-investing into the tea industry. Knowing this, i'd be happy to choose Cafédirect if it's going, but I do wonder if there's a slight change to the blend they could do to sweeten it up a bit (it's a little serious) as this would make it superior on all levels. I'd also like to see them move to organic as well in the future, which could lead to better health for growers and consumers.